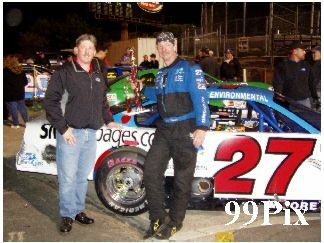 John Moore, #27, earned his second consecutive sweep at Stockton 99 Speedway, but Pete Anderson made sure it wasn't an easy accomplishment. Moore and Anderson battled for the lead during the entire NASCAR Western Late Model main event, but Moore was finally able to get control of the race and got the victory on Saturday night. 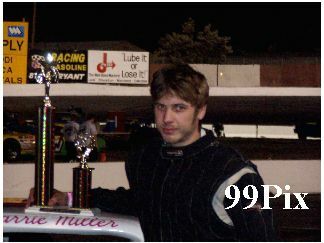 Moore won the main event, the trophy dash and was the fast qualifier as he pulled off the clean sweep. 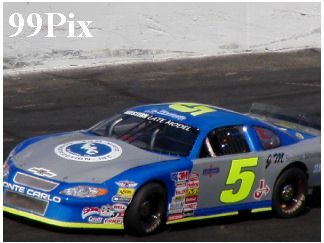 He also swept the WLM program on April 16 and both wins for the Granite Bay driver have come in his new 2005 Chevrolet Monte Carlo. "We've run the car twice, and we've won twice, and this was a very tough one (on Saturday)," Moore said. 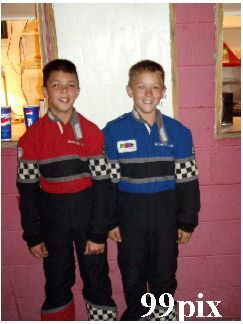 "It was without a doubt one of the best dogfights I've ever been in, and intensity of the racing was top caliber." Moore set the fast qualifying time at 14.331 seconds and won the dash. Moore got to pull the card to set the inversion for the main event. He pulled a zero, meaning there was no inversion and as the fast qualifier, he got the pole. Anderson started next to him on the front row, and the battle began. 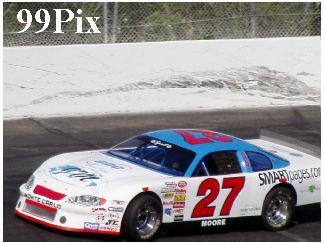 Moore edged ahead on the first lap, and led until there was a yellow flag on lap 11. 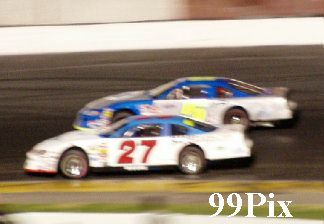 Anderson took the lead on the restart and led until another caution period four laps later. 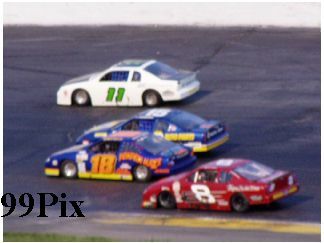 Moore took the lead back on the restart, and never trailed again. 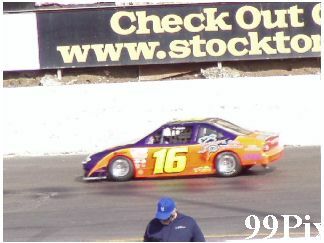 In the American Limited Stock Car Division Kannai Scantlen of Stockton won his second main event of the season. 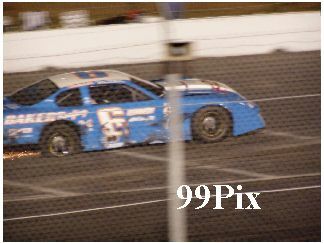 It didn't come easy as Rich Harper of Stockton in his new #5 Graduate sponsored rig was wide and in the lead for the first half of the race. 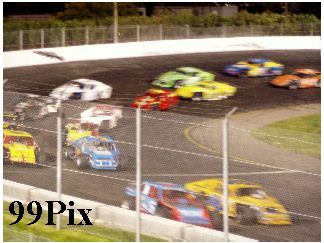 But Scantlen's persistent road course maneuvers starting the race from mid-field got him by lap-24 within striking distance of Harper. Scantlen and Harper split and passed lapped traffic again and again in an incredible driving display. 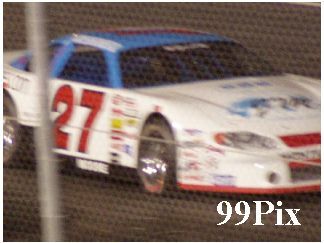 Also from Stockton, #75 Chad Holman was coming on and points leader Harper was possibly showing tire wear as at the checkered flag it was Scantlen, Holman, Harper with Charlie Clawson of Modesto fourth and another Stocktonian in fifth, Joe Allen. 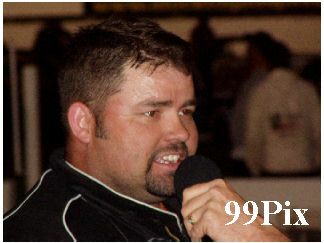 Donnie Darter, #99, of Stockton set a new ALSC Track Qualifying record of 15.802. 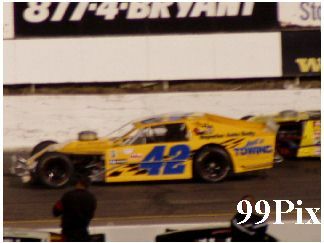 In the Grand American Modified Division, the sleek IMSA style open wheel all-horsepower, no weight racecars took off in their Main event with Sacramento's #5p, Jason Philpot taking the lead, with 99 newcomer #42, from Dixon Jerry Dubach in second. 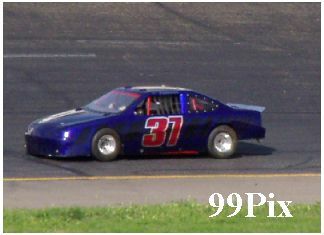 Track Announcer Bruce Riley picked third place holder Mike Regelman as the first three looked like they could run off with the race. 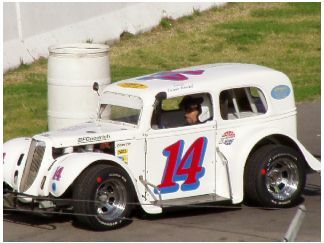 But after two yellow flags #10a, Jay Linstroth of Citrus Heights had worked his way up to third place from his starting position of 6th, as well as Mike Beeler, #15, and Kyle Gottula, #21, of Modesto were coming on strong. Linstroth grabbed second spot on another re-start and the door to door battle was on. 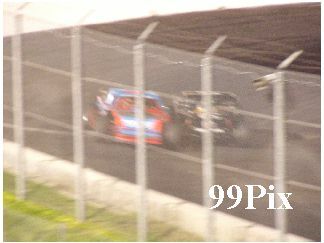 Masterfully done by both drivers, #5 (Philpot) and 10a (Linstroth), drove hard with both pushing their machines to the limit. 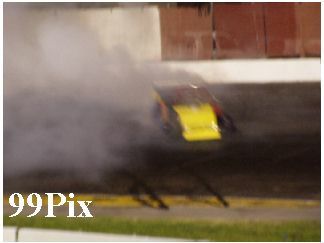 Ten as it would likely happen, a racing accident with Linstroth nudging Philpot and spinning him in turn 2. Normally in such an event both cars would go to the back of the pack. 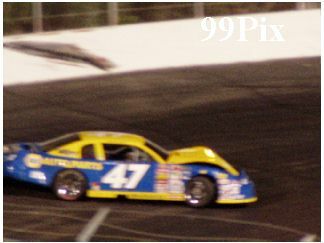 But as they came around the turn to re-group unknown to the fans, Linstroth gave Philpot a little nudge from behind and the Philpot brake checked Linstroth under the yellow condition. The result was Linstroth being ejected and Philpot to the back. 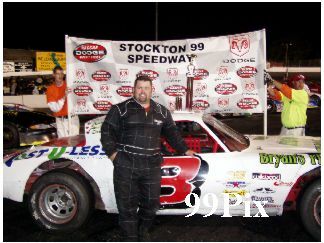 This opened the door to Kyle Gottula, the second generation driver from Modesto, for the win with Mike Beeler of Stockton second, Mike Regelman third, Jerry Dubach fourth and Stockton's #11 Stuart Cullom who kept driving even though suffering mechanical problems to finish fifth. 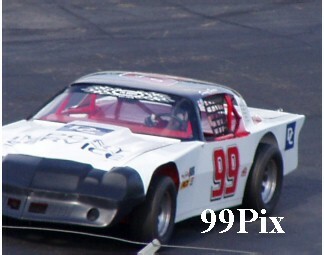 In the Legends of the Pacific, Mark Bailey of San Lorenzo, the defending 99 Champion, set fast time of 15.923 with Frankie Winchell of Sebastopol second at 15.929. The trophy Dash was won by Redding's #2 Zachary Kavert followed by Bailey, D. Winchell and F. Winchell. 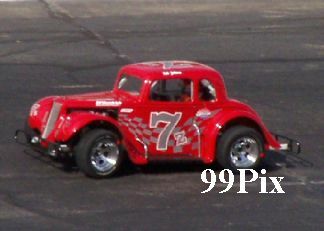 In the Main event #7j Jake Jackson of Kelseyville took the early lead and held it for 9 laps. Martin McKeefery #27 of Milpitas, who's only 17 years old, then grabbed the lead for 6 laps, with #14 Frankie Winchell all over him until on lap 16, Winchell took the lead. 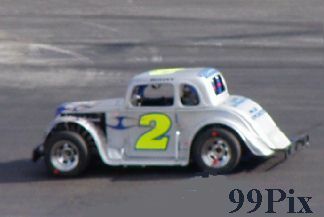 Defending champ, Mark Bailey started 8th and by the fourth lap had moved to 4th place. 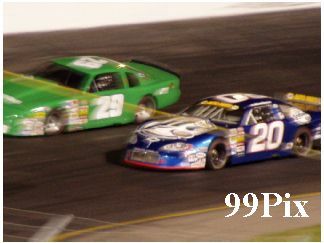 He hung there until lap 17 when he passed McKeefery and took after Winchell, where the two battled as well as #40 having #27 buzzing him for second. So as it all unfolded, First #14 Winchell, Second #40, Bailey, Third #27 McKeefery with 7j, Jake Jackson and 7z, Rick Zollman of Pleasanton rounding out the top Five. 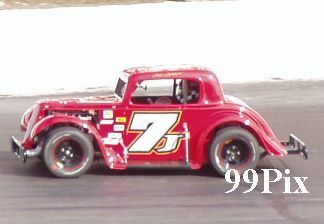 In Legend Heat #1, #7z, Zollman finished first, followed by #0, David Winchell of Sebastopol, (fifth fastest qualifier at 16.049), with Bailey and Rick Andrews of Santa Clara rounding out the top 5. 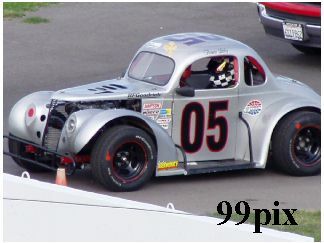 In Legend Heat #2, Terry Miller of Ripon finished first with #05 Thomas Lieby of Copperopolis second, Stockton's #55, Fred Clement third, and #37 Frankie Marks and Ted Clement in #58 completing the top five. Jacob Gomes, #16 of Manteca, has definitely got Stockton 99 Speedway dialed in. 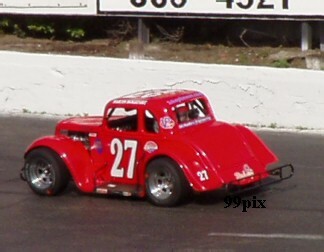 He won his second 20-lap Main Event last Saturday night. 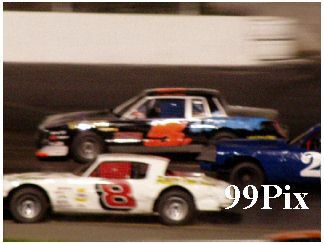 Second place went to #05, Robert Czub of Sacramento,third to Cody Arsmstrong, #31 of Vacaville, 4th to Jerry Fellman, #01 of Roseville and fifth to Scott Chapeta, #48 of Livermore. 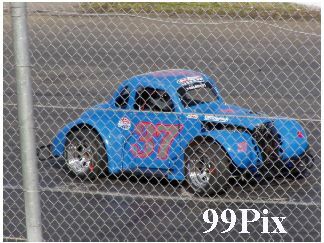 During the Main Event , a red flag stopped the race when #37 Marcilia Phlomon of Antelope spun in turn 3 and was rammed in the front by another car. She complained of foot pain and was taken to the local hospital. Even though Chris Drysdale was third fastest qualifying with 15.486, he managed to hold off the faster qualifier, Danny Basto (15.446) of Lodi in May 7th's Pro 4 Truck 20-lap Main Event for the victory. Mark Henslee of Lathrop was third followed by Mike Curry of Lodi, and Fifth was Nathan McNeill of Oakdale. Danny Basto won the Trophy Dash and fast time was set by Ron Robeck of Milpitas at (15.378).